As mentioned, I arrived in the village of Sampiring (pronounced like "San Parii") on Tuesday June 1st. One more funny thing I didn't mentioned in the previous entry -- during the drive Edie tried to teach Ibrim and Baro how to say my name. I generally let anything recognizable slide, though Ibrim's habit of enthusiastically greeting me with "Freak!!" (ie "Fricke" without pronouncing the E as one should and drawing out the i in the middle) was a bit unsettling. It was amusing to watch them try to say "Kris" and come up with everything from "KrisT" to "Krish" to "Kwis" before getting it right. Its funny how much trouble an unfamiliar name can be. And I for my part am still not sure if I should be calling him Bara or Baro. July 2nd, Wednesday - Woke up to pouring rain, the wife of Abdul brought me an omelette, as she would every morning (except the last morning, whereupon I ate the chicken). I regret not retaining her name but again, these unfamiliar names just don't stick in the head. She was very nice though, and always seemed to have kind of a mischievious smirk about her. After eating I sat on the porch with Baro, sipping my tea, as the rain gradually petered out. Once the rain stopped the beekeepers started filtering in one by one into the little square in front of the house. We set up chairs and did introductions and planning for the upcoming two weeks. 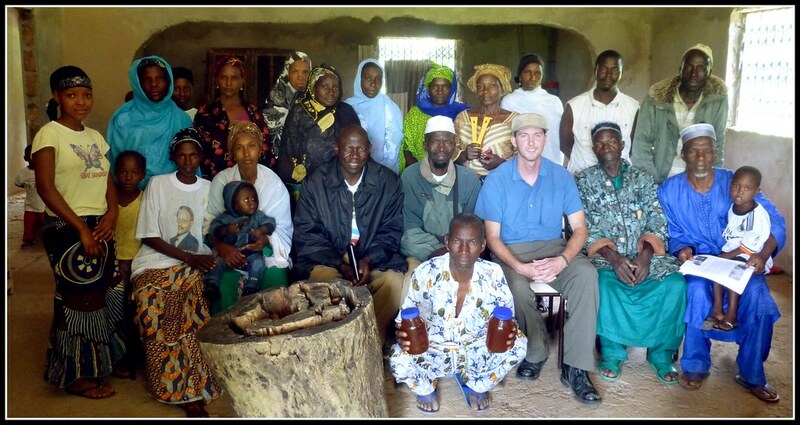 I think about 70% of the beekeepers in the group are named Mamadou. Seriously. And another 60% have Diallo as either a last, middle, or first name. For example, just taking the two business cards I have on me at the moment, the FAPI (national beekeeping association) president is named Mamadou Yaya Diallo, while the owner of the house I was staying in is (Elhajji) Diallo Mamadou Cellou (Elhajji being a title, denoting having made the pilgrimage to Mecca). I learned that they'd previously been visited by a Peace Corps volunteer "named Dave," who had come to teach them about beekeeping years ago --probably the reason there are kenyan style hives here now-- "but then he died." We dispersed around 1 so they could pray and I could eat lunch. Over the next two weeks I'd spend the afternoons either sitting on the porch with Baro (till I finished reading my book), or wandering the surrounding countryside (if it wasn't raining). At first the children of the village were very fond of greeting me with "bonjour!" from afar. Then after a day or two many grew brave and would run up to shake hands with me. Shortly, one of them in particular, a five or six year old boy named Mamadou de Boba (brother of Mamadou de Ajeilla or something) pretty much adopted me. He would spend afternoons climbing the porch rail near me and talking to me in the local language, to which I'd sometimes respond at random with "oh really?" "no kidding!" and "are you sure about that?" It was cute and amusing, though I certainly got a feel for what a burden it can be trying to keep a five year old occupied! I also learned that while he was mostly pretty well behaved, if he saw my phone, and god forbid saw me playing the 2048 game on it, he would immediately become a grabby demon. Possible proof that electronic games really are the downfall of youth today. Whenever I was walking across the village with the smoker he would run up and get it and carry it for me, he seemed to adopt this as his sacred duty... and right. Woe unto other children who might try to take it! He also of course tremendously enjoyed puffing it when it was lit, though he quickly learned his older brother did not appreciate having smoke puffed at him. Around 7:30 every evening we would start heading up to the elder's house for prayer. Baro, I found, seemed to be very enthusiastically religious. Not the kind of enthusiasm that makes one boorishly talk about it a lot and evangalize to people, but in that he seemed to genuinely relish prayer time and the whole rigamarole of ramadan. I was glad they made me feel very welcome, inviting me to come along with them every evening. I would help set up the mats and then set up my little stool off to the side. Random observation: while they're praying one sees a row of the bottoms of people's feet, and all but one of them had pale bottoms-of-feet. One of the villagers had feet that were the same color all around, I wonder if its a genetic trait from another tribe or something. Then we'd troop back to the house. Most of the other villagers would head off to the mosque, one kilometer away, but Baro, with his pronounced limp, was unable to make the journey. 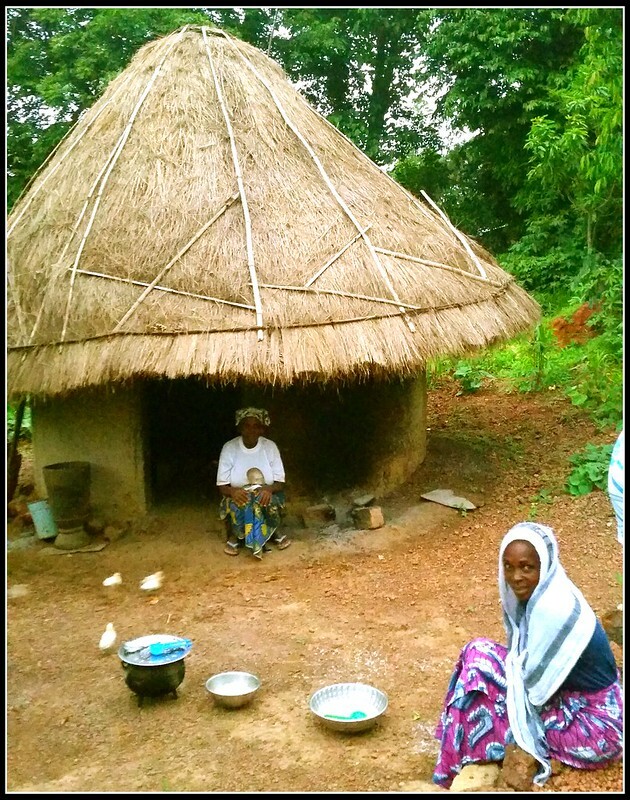 Every evening one of the Mamadou brothers would bring a small brazier of hot coals and Baro would spend most of the evening tending his tea kettle over these coals. I somewhat suspect half the reason for the tea was for the sake of doing something. Watching him tend his tea I'd often think about how very much like his ancestors for countless generations he must look just then, tending his little tea pot on into the evening. A man who can run the national branch of an organization, make business planning presentations fit for any boardroom, and sit in the dark carefully tending his tea pot like a nomad. The first two evenings, when Elhajji Mamadou returned from the mosque several other men from the village came back to the house with him and they spent the evening discussing politics. During dinner they would run wires out to the car and power the lights with its battery. On the morning of the third, however, he departed to drive to Dakar, Senegal, some 900km away. After that our evenings were a lot quieter, but Mamadou de Boba would come and try to talk with me until sent to bed by his mother, and then his father Abdul and another fellow would come over and maybe take a cup of tea with us before dinner. Dinner every night came around 10:30 to 11:00, brought by Abdul's wife. It was generally a rice dish with sauce and some meat, or the sauce and meat with homemade french fries which I think was more a concession to me than a tradition. Unlike the extremely extremely chewy meat in Nigeria the meat was pretty good, though I always find it unsettling trying to eat by flashlight light meat with lots of bones to pick out. July 3rd, Thursday - Day Two: Intermittent rain, but had a good first day of lecture. After lunch I enthusiastically got my bee suit and equipment ready because we were going to visit the beehives! But they looked at me in alarm when I came out with my equipment and informed me "there's been a misunderstanding, we're not going to OPEN the hives right now, we're just going to look at them"
"Well... I've got the equipment, let's open them!" I say. "But no one else brought their suits" they say. ::sigh:: okay. So we'll go look at beehives. Note to self, future projects make sure its known beforehand that I don't see much benefit at just looking at the outside of beehives. On the plus side I was overjoyed to discover I had finally forgotten something, so all was right in the world -- I'd left my flip-flops in the hotel in Canakry. Additionally I only brought one pen and it almost immediately disappeared. By this point the batteries on all my electronic devices (two phones and a laptop) were running down pretty low, and without them or a pen I wouldn't have any way to note things down! July 4th, Friday - Day Three: "Still no bees. Batteries all dead. Rained most of the day." I felt lucky because it was "the day off" and they still scheduled a field visit, to a group of beekeepers in a town about an hour away near the town of Pita. 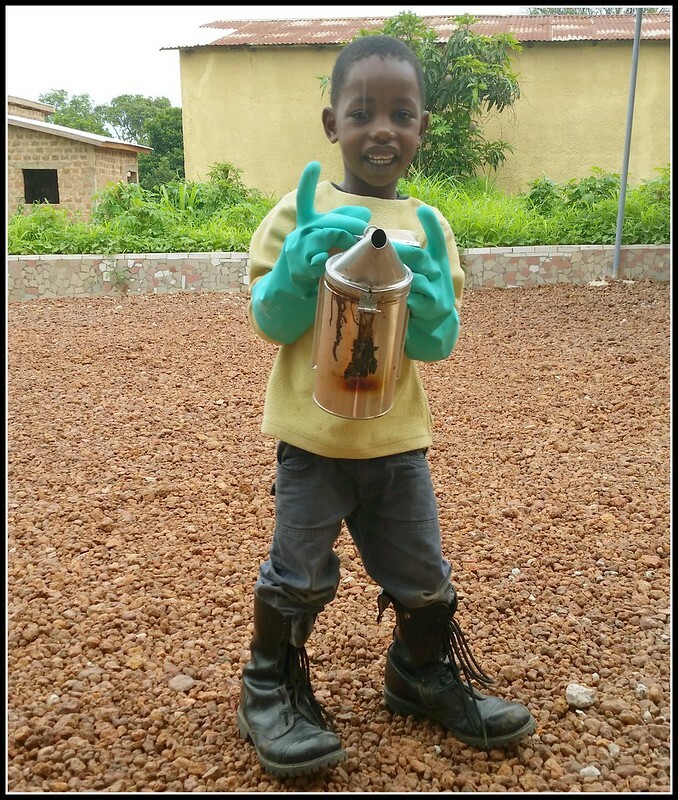 There is currently a Peace Corps volunteer working on beekeeping with them, who also doesn't have any previous experience at it. I talked to her one the phone the day before but she wasn't present when I visited (ironically, she was in Labe at the time, the town near where I was based). I was a bit disappointed, I'd have liked to meet a Peace Corps volunteer in the field, would have felt a little like things had come full circle since the PC dropped me in 2011... and as she doesn't have prior beekeeping experience I'd imagine I could have given her some good advice. But I suppose she'll have to get it from the locals I talked to. Though the weather was fine in the morning, after we did some question and answers in the morning they broke for prayer and we were going to visit beehives after, but it was pouring rain by the time prayer was done. Was getting very frustrated that we hadn't opened any hives yet. Another thing happened that was becoming apparent -- they seemed to think it was more desirable to eat indoors, always. This means frequently when there was a perfectly good open air porch I was happily sitting on, or chairs under the shade of trees, when tehy brought food they'd beckon me indoors and set me up in some dark room that if it had a window at all it was small and barely sufficient. I didn't argue much because I kind of assumed maybe since they were fasting they didn't want to see me eating, but in the end I think it was just how they thought I'd want to eat for some reason. In this case I was happily sitting on the porch and they set me up to eat in a room where I could barely see the food at all. As it was a grilled chicken full of bones to pick around I found this rather tedious. Jumping ahead a bit, on my very last day I was due to leave just after lunch, all the beekeepers were hanging out in the village square, and when my lunch came they of course put it in an ill lit room in the house away from the square. I brought it out and sat in the square with it and no less than three people immediately urged me to go sit in the house, but I was not about to go sit in a dungeon during my last hour with the group. July 5th, Saturday - Day Four: We finally got a generator hooked up, but it was insufficient to power both my laptop and the projector, nor even my laptop alone very well, and by the time we were done in "the classroom" my computer only had about 20 minutes of battery life stored up. We were finally able to go into some hives this day though. The first several hives we visited obviously hadn't been visited in a long time and were completely full. We didn't have a bucket to harvest honey into so after opening several hives we resolved to postpone opening any more hives until the next day when we'd be prepared to harvest honey. In the afternoon little Mamadou de Boba and I went exploring around the area surrounding the village. I'm pretty sure most American parents wouldn't want their five year old disappearing for hours with some stranger they've only known for a few days but no one seemed the least bit concerned. I tried to instill in Mamadou an interest in insects, but lacking a common language when I pointed out a small insect on the ground he often interpreted it as an invitation to smash it. Similarly I embarked on an attempt to excavate a hole into the middle of a termite mound because I've heard they're hollow inside, and wanted to find out, and he was enthusiastic in helping with this, but probably just saw it as an opportunity to hack up the termite nest for fun. That evening Baro had got his hands on an avocado, which it turns out he absolutely loves. Just about every day after this he'd have one avocado after the breaking of the fast, which he would very methodically peel, almost as if it were a ritual. Then he would hold the pit up admiringly and remark upon it and where he would plant it, and finally he would reverently eat the avocado flesh, clearly savoring every bite. He also has a strong tendency to find wild plants and gather their leaves while noting their medicinal properties. I think he sometimes integrated them into his tea. 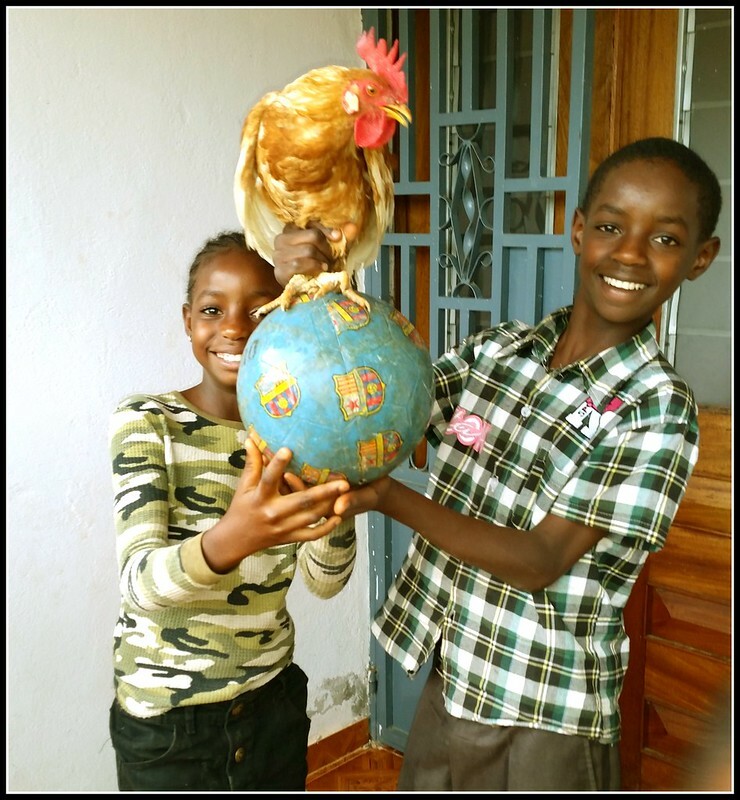 "The people of the village want to honor you with a gift of two roosters ... what do you want to do with them?" "Uh.... I guess I'll eat them?" [some interchange in local language] "okay they will cook the first one for dinner tonight." We went through very many hives today, it was a very good day. Most of the hives did not in fact have surplus honey to harvest, I think they had all been harvested in May but a few did have more surplus honey already. No hives were bad tempered and so I was able to work without gloves or a veil on most of them and this encouraged many of the local beekeepers to try it without gloves as well, which is a really good sign of comfort with the bees. If they're not comfortable/confident with their bees they're not going to take good care of them. In the afternoon I went exploring the surrounds further afield by myself this time. And that brings us halfway through the time in the field, and this has gotten fairly long already so I'll save the latter half for another entry. Still to come: more rain! will I ever find electricity? And do I ever meet the cute girl from the village who's always smiling at me from across the square? ?